New members of Galvanize each received Flockd on their first day. Flockd is thrilled to support Galvanize members with productivity and connectivity. The Perfect Icebreaker! For networking or breakout sessions, Flockd signals an, "open conversation zone," welcoming others to join the conversation. Meet Michael. Michael is from Germany and has been traveling for 4 months with a focus on studying happiness. He's participating in Flockd Friday today and wants to know: "If tomorrow was your last day, what would you do today?" Whoopi Goldberg Using Flockd to Be Productive! Being Productive at Work is Critical! Whoopi Goldberg says she wants to use Flockd it at work, so people will "Get the Flock away from me!" : ) Thank you for letting us quote you Whoopi! Millions of entrepreneurs, freelancers, designers and startups were given the tool that brought them all together. Now in a buzzing hive of creativity and ingenuity, who knows what can be created? It's like building a think tank where you're simultaneously growing 20 different companies and they are all working together while still working for themselves. The sky is the limit. Aliza Sherman is a very good friend of Flockd cofounder, Janice Caillet, from the early Internet days in New York City (‘93/’94). This is Aliza’s 10th book: Social Media Engagement for Dummies. Aliza and her coauthor, Danielle, showcases Flockd as a great example of an in-person social media tool. They could not over emphasize enough the importance of getting out from behind our screens (any screen, phone included) to be with real people. Flockd is the real-space pyramid that does exactly that!! Savvy Social Engage Sponsors ~ so at every event there will be great wine and cheese in a terrific space. The League of Extraordinary Coworking Spaces (LEXC) is a unique national network of coworking spaces with a common standard of excellence. Wine Sisterhood is an online community where women can join the conversation about wine, food, travel, style and entertaining. Cabot Creamery Cooperative - Founded in 1919 and owned by 1200 farm families in New York and New England. Makers of The World's Best Cheddar. ​The larger Flockd has arrived! A bigger tool for a big intention, strengthening connectivity & productivity everywhere! Why would your office disappear? If you work in a corporation, you certainly do in a commercial building with colleagues who are most of the time out of their jobs - at a meeting, lunch or business trip. Get ready for a drastic change. The global recession, the development of new models of economy and more concern for the abrupt climate changes are guidelines to growing - coworking wave. How will your office look like? Office setting will be structured in a more relaxed work. Leader in innovative, office design as Turnstone creates all relaxed and comfortable furniture for coworking spaces. Architectural solutions which separate sectors will disappear. You will know more about what is happening in other parts of your organization. Open office spaces will create an atmosphere reminiscent of the cafe, promoting creativity and transparency. New office toys as Flockd will help people from different sectors to start a conversation so stimulating productivity. You will have to interact with a coworker's a much friendlier, more acceptable and transparent manner. Resources such as the kitchen, bathroom, coffee, office materials Delic more than before. Take a deep breath and get ready to split up with some of the pen that is in your hands ... maybe even a monitor! It 'fun and useful to use flock to this NY startup in a business setting. If you are a coworking something for you. If you’re like most people, you probably work in a large office building alongside colleagues who, much of the time, are away from their seats in meetings, at lunch or traveling for business. Driven by a global recession, an emerging sharing economy, a more mobile workforce and concern about climate change, COOs, entrepreneurs and other business leaders are looking for ways to make office spaces more efficient. Paying high real estate costs and electric bills for people who use their space 30% of the time doesn’t make good fiscal or environmental sense. For these reasons and more, a drastic change is underway that will make the traditional office as you know it disappear. Collaborative work spaces everywhere are defining themselves as “coworking spaces,” or workplaces that are shared, fostering productivity, community and collaboration. Good for startups, freelancers, independent workers and entrepreneurs, the trend is growing exponentially. According to Deskmag, the number of coworking spaces has increased 200% annually for seven years. The Global Coworking Unconference Conference (GCUC) convened this month, sharing new strategies for the future. The architectural silos that separate departments will erode. You will know more about what’s happening in other areas of your organization. Open plans will create cafe-like atmospheres and promote creativity and transparency. Office layouts will be more structured for liquid, easy work. New workplace tools like Flockd, unveiled at GCUC, will help people across departments start conversations while increasing productivity. Flockd offers a new system for people to signal whether they’re free. The available, “Lets Flock,” signal encourages coworkers to interact and connect, while the, “I’m Busy” signal sets clear, healthy boundaries. Better work flow means more free time. Sharing an office means the stuff you need, but hardly use, is also accessible to 100 other companies who share your space. One paper cutter for 100 companies instead of 100 paper cutters. And it means the usual overhead, like rent and heating bills, is split among them too. As big business comes aboard the coworking revolution, the triple bottom line gets better. American Express recently lowered its carbon footprint by 27.5 percent, citing a decrease in business travel and the creation of centers for virtual meetings. Widely recognized for championing economic development and entrepreneurship is Zappos CEO Tony Hsieh, championing Las Vegas and its Downtown Project to become the coworking capital of the world. The League of Extraordinary Coworking Spaces (LEXC) has become a resource for such corporations expanding their workplace strategy. The organization’s first corporate customer is Accenture. Good for mobile workers, LEXC offers a new work solution for larger companies. Disclosure: The contributor Marissa Feinberg is the shared office space owner of Green Spaces NY, upcoming member of LEXC, cofounder of Flockd and attends GCUC. Does Collaboration Actually Hurt Productivity? In some offices the insistence on collaboration is forcing people to take creative measures to focus. What's the new etiquette when it comes to connection vs. concentration? Collaboration is all the rage (so much so that some are even speculating it might be the new greenwashing), but this trendy we're-all-in-it-together ethos doesn't just set off some folks' hype sensors, it also presents other dangers. Let's be honest: collaboration can kill productivity and focus. The walls have come tumbling down in offices everywhere, but the cubicle dwellers keep putting up new ones. They barricade themselves behind file cabinets. They fortify their partitions with towers of books and papers. Or they follow an "evolving law of technology etiquette," as articulated by Raj Udeshi at the open office he shares with fellow software entrepreneurs in downtown Manhattan. "Headphones are the new wall," he said, pointing to the covered ears of his neighbors. No one may be mourning the death of the beige cubicle farm, but that doesn't mean they're not looking for new ways to get a bit of what cubes offered – privacy. Headphones may be the simplest way to go (just about everyone has an iPod in their bag these days), but for those who find music distracting or are faced with truly persistent colleagues, other measures to keep would-be collaborators at bay may be in order. Marissa Feinberg, owner of Green Spaces, a New York co-working space for socially conscious start-ups, observed this first hand. "In any open, collaborative environment, people must always fight interruptions. Therefore, collaborative work spaces, for start-ups, or for major companies like Accenture or Google, are going to need a new best practice for focus, and a new set of etiquette for connection," she told Inc. Her low-tech solution to interruptions mania? A little gizmo called Flockd that sits on your desk. Turn it one way and it displays a big red X to colleagues warning them you're engaged and uninterested in connecting at the moment. Turn it another way and it becomes a little pyramid-shaped announcement to the world that you're open for collaboration. Not only does Flockd serve as a visual signal beckoning co-workers to connect with you when you're in the mood, but Feinberg also believes that, by demanding old-school manual manipulation, it helps workers be more conscious of what sort of work they're doing and how much collaboration time is optimal of them. "I may put [headphones] on and then forget I am wearing them. Consequently, everyone around me thinks I am busy and no one approaches me for the entire day. And I can get too deep into my head to remind myself that human connection is important. It's not healthy to be heads down all the time," she says. Feinberg mentions "a new etiquette for connection." What are your rules for respectful collaboration? Jessica Stillman is a freelance writer based in London with interests in unconventional career paths, generational differences, and the future of work. She has blogged for CBS MoneyWatch, GigaOM, and Brazen Careerist. @EntryLevelRebel. Click here to read this story on Inc.com. My coworking space is great! I have really made friends here and we all help each other out. The problem is, sometimes I am really in the middle of writing, and when I get interrupted by a question from a coworker (which I am happy to answer) it breaks my flow for over an hour. How can I turn off without seeming 100% anti-social? CoworkingBasics is a fortnightly column by Anna Cashman, market research and social media person for Deskwanted - online portal to find and book coworking spaces worldwide. Are you a coworker, coworking space operator, or just want to know more about coworking? Email her your questions. In order to truly benefit from a coworking space, you need to set ground rules for yourself. Yes, the routine comes easier compared to when you’re working in a café or home office, but it still needs attention. One way to do this is to set personal times when you allow yourself to be distracted. Just before lunch, for example, is ideal, because it can’t interrupt you for too long, and your concentration is probably waning anyway. Note the ‘allow yourself’ in this. Just because you have set yourself ground rules, doesn’t mean other people will follow them. Luckily though, just as ‘knowing the people in your space’ created your conundrum, it’s actually its own remedy, too. If you know those people well enough to share advice and exchange ideas with them, you should also know them well enough to politely tell them that ‘now’s not the time’. Just because you’re not answering right then and there, doesn’t mean you’re not answering at all. To avoid conflict, set another – more convenient – time to speak, and then devote your full attention to them then. Your fellow coworkers will be grateful for it. Strike a balance with this strategy, too though. There’s value knowing the difference between a quick question and extended discussion; and setting a later date to discuss your favourite colour is a time waster. Understand the difference, then be strict with yourself: take simple questions as such, and avoid getting too involved or give responses to questions that haven’t been asked. If it’s the act of being interrupted that really gets your goat, consider wearing earphones (my last column talked briefly about ear-phone etiquette) when you’re in the middle of a concentration streak, or when a deadline’s looming. There are also neat contraptions to help let others know when they’re able to approach you. Flockd is one of these, helping coworkers connect in the real-world when it suits them most. It was developed in partnership with Green Spaces and New Work City, so you can be sure it’s designed with coworking in mind. You have to be strict with these rules, but if you deliver them politely, everyone will be happier for it. Remember too that sometimes it’s okay to say no. You joined your coworking space to work, and fellow community members shouldn’t expect you to share your know-how too often for free! Being able to ask people questions – and offer your feedback – is one of the greatest advantages of joining a coworking space. Click here to learn more about coworking, and here to start searching for a flexible desk within a professional community in your neigbourhood. And here to ask Anna a question of your own. Photo Credit: Curumuri and Flockd. Click here to see the original blog post. NEW YORK, NY - MARCH 4th, 2013 - FLOCKD, a NEW low-tech tabletop pyramid, powering connectivity and productivity for innovation, is launching its beta during the Global Coworking Unconference Conference. Emerging from its pilot in partnership with New Work City, Purpose, La Colombe, iSTARTUP Community Centers and Green Spaces, among others, the company is launching larger sizes and announcing more than 50 locations that are now “Flockd-enabled”. Users put Flockd upright on a table, writing their name, organization and topics on its dry-erase sides, indicating they are open to connection. When people are busy, they turn Flockd on its “X” side to set clear, healthy boundaries. The effect is a real-world gchat, live tweet or spontaneous Meetup. “Flockd drives face-to-face connections and productivity, which are key to driving innovation, particularly in shared workspaces. Flockd solves the pain point of setting clear, healthy boundaries when we’re busy. Flockd also has the ability to open conversation zones, aiming to fuel collaboration, which is often what sparks new innovative ideas,” says Marissa Feinberg, Flockd CEO, and cofounder of Green Spaces. “After testing our pilot pyramid we are excited to release new, larger sizes. Flockd will be a more visible, stronger signal of when we’re free, when we’re busy and what we want to ‘flock’ about.” The much larger 33cm size is perfect for groups. For event producers the larger Flockd pyramid is a perfect visual cue for people to connect between speakers at conferences, seminars and other events. Placed on tables in the break/coffee area or utilized in open space type events, topics can be written on the Flockd pyramid catalyzing conversations. "Anything that encourages face-to-face interaction improves our lives,” says Helen Kramer, co-founder of Personal Change System and Author of Liberating the Adult Within. “We have empathy centers and when we use social media, we see when people 'like' what we post, but we don't see when we hurt someone. Therefore, the empathy centers can atrophy like a muscle that's not being used. In an increasingly technology-driven world, Flockd can help future generations be more empathic.” This month Flockd is starting to reach out to Universities to encourage the use of Flockd in their shared spaces such as in their student unions and cafeterias. For the second year running, Texas will host the biggest coworking conference in the world. The Global Coworking Unconference Conference takes place at the Austin Music Hall on March 5 & 6. The GCUC, or “Juicy” as its commonly known, is the most important event of its kind and a bright spot on the calendar of coworking enthusiasts everywhere. GCUC aims to bring together the best and brightest minds in the coworking movement, to share ideas and inspiration and develop new strategies for the future. Attendance is open to anyone with an interest in coworking. The two-day event is split between an organized conference on the first day and an open-format unconference on the second. New Work City is the result of the collective effort of a community of people who share a common set of values and needs. We are proudly built and based in New York City, the greatest city in the world. To learn more about the amazing people who make New Work City possible, visit our about and thanks pages. We are a part of the global coworking movement, and if anyone says it's spelled co-working, correct them! Purpose creates 21st century movements. We deploy the collective power of millions of citizens and consumers to help solve some of the world’s biggest problems. We develop and launch our own social and consumer movements using our model of movement entrepreneurship, and we work with organizations and progressive companies to help them mobilize large-scale, purposeful action. For nearly two decades, La Colombe has been a leading proponent of ethical long-term trade with coffee growers as well as a key supporter of certification organizations such as Fair Trade Alliance, Rainforest Alliance, Smithsonian Migratory Bird Center and others. Most important, however, is our direct influence on the well being of our coffee growing communities - from water resource development and borehole drilling to building and maintaining schools which support hundreds of orphaned children with housing, health care and education. We recognize that as coffee roasters we occupy a unique place in the world, a spot on the narrow bridge between the developing world and some of the most affluent consumers on the planet. To us, this role is more than a responsibility, more than a popular philanthropic logo but a rare privilege seldom afforded. At La Colombe, we intend to make the most out of this opportunity. iSTARTUP is a catalytic collaboration of partnerships, services and solutions to create greater resilience and revitalization on multiple levels: Community, Neighborhood, Organizational, Team, Family and Individual levels. Taking a system-thinking and solutions-driven approach to any change initiative, the iSTARTUP team is comprised of not only consultants and advisors but also of entrepreneurs and innovators. In essence, iSTARTUP assists in making systems more fluid, conversations more productive and end-results more powerful. Green Spaces provides the infrastructure for triple bottom line companies to work and grow. With locations in New York and Colorado, its coworking shared offices are hubs for sustainable business leaders gathering social entrepreneurs, startups and freelancers alike. Green Spaces builds strong community, offers special events for networking, serves as connectors, and has been home to more than 500 game-changing startups and organizations. Currently Green Spaces is home to more than 150 companies in NYC and Colorado. GreenSpaces also started the Green Leaders Global network, fostering dialogue and uniting more than 1,000 executives in social entrepreneurship. As an inherent connector, Marissa enjoys sharing stories and championing people and ideas that make us think, laugh, do good, and take action to pursue our dreams. And since it’s the work of changemakers that have the most touching stories and make the greatest difference, Marissa co-founded Green Spaces New York, the go-to coworking space for social entrepreneurs to work, innovate, and host meaningful events that drive dialog and action. To follow her love of connection culture, Marissa is launching Flockd, inspired by coworking spaces and social movements with the dream to create a more open society. In addition, Marissa blogs for Forbes and serves on the boards of Green Map, NYU Stern’s Annual Conference of Social Entrepreneurs, and the Zoological Lighting Institute. Marissa also speaks about PR for Early Stage Startups for Investor’s Circle Conference, NYC’s and Kaufman’s FastTrac program, and for Parsons The NEW School for Design. Prior, she worked in CSR for the General Electric Foundation and social design for Felissimo Universal Corporation of America. Janice Caillet is an innovator and agent for conscious change with a passion for revitalization and resilience on multiple societal levels. Her life's purpose is in being a bridge between people, ideas and opportunities and she finds herself very fortunate to have lived 'on purpose' for the majority of her life. where coworking space leaders gather annually to share best practices, highlighting a movement built around workplace community, connections and collaboration. For a press pass to GCUC, contact anthony@grindspaces.com. Visit austingcuc.com/2013/schedule/ to see the conference and unconference schedule. The media are invited to visit Flockd at the Turnstone lounge at GCUC.FLOCKD, INC. is a NEW low-tech product, powering connectivity & productivity for a better future. We live in networks: Facebook, Twitter, LinkedIn, Foursquare, and many more. People can easily connect online. What about offline? People can use Flockd as an invitation for building relationships, collaborating, building an in-person following, being productive, creating open-conversation zones, and signaling needs, resources & topics. , and invite connections, connect dots, and take action for a better, more connected and productive world. Janice has also led, developed and coached leaders and teams in a variety of sectors from technology and telecommunications to gourmet frozen food and social enterprise. She is an international public speaker in areas of revitalization, resilience, career empowerment, innovation, entrepreneurship, teams and leadership. Janice recently moved to the Boston area after living more than seven years in Europe. She lives with her husband, Alexander Caillet, and their daughters. If you’re like most people, you work in a high-rise building alongside colleagues who, much of the time, are away from their seats in meetings, at lunch or traveling for business. Get ready for drastic change. A global recession, emerging sharing economy and more buy in to climate change are each pointing boardrooms toward efficiency. Your office as you know it will be gone. You’ll have to come to Austin next week to find out. For the second year running, innovators in work design will host the biggest coworking conference in the world. For those of you new to the concept, collaborative work spaces everywhere are defining themselves as “coworking spaces,” or workplaces that foster productivity, collaboration and community. 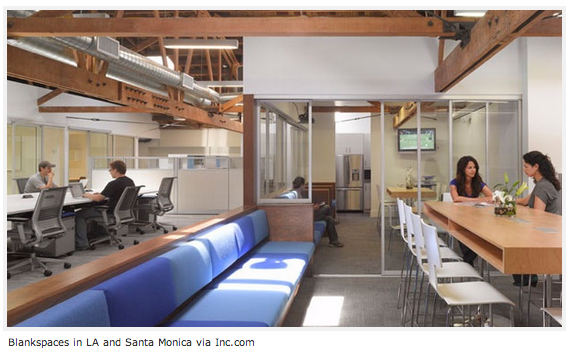 According toDeskmag, the number of coworking spaces has grown 200% annually for seven years. Want to see a map? LiquidSpace will show you options in 350 cities around the world. The Workspace Association of New York represents over 2 million square feet in the Tri-State area alone, managing a powerful center of influence. The Global Coworking Unconference Conference (GCUC), or “Juicy” as its commonly known, aims to bring together the best and brightest minds in the movement, to share ideas and inspiration and develop new strategies for the future. COOs will not continue to pay high electric bills and real estate costs for people who use their space 30% of the time. Your HR departments have already started calling me and my peers for pricing, and booking tours and visits given by our “Community Managers”. We are the proud proprietors of the new world of coworking. We design for efficiency; our business models depend on it. We are daring entrepreneurs who have challenged the status quo to create unique environments, building blueprints as we progress. The design of the traditional corporation and office suite will be dated, your company’s seats will be re-situated, or you will be relocated to wonderful coworking spaces. The League of Extraordinary Coworking Spaces (LEXC), a unique network of coworking spaces with a common standard of excellence, has become the go-to resource for corporations expanding their workplace strategy to include coworking. Gathering industry pioneers, the organization’s first corporate customer is Accenture. Especially smart for its mobile workers, LEXC makes a compelling case to try a new work solution. As big business comes aboard the revolution, the triple bottom line gets better. American Express recently lowered its carbon footprint by 27.5 percent, citing a decrease in business travel and the creation of centers for virtual meetings. Widely recognized for championing economic development and entrepreneurship is Zappos CEO Tony Hsieh, now championing Las Vegas to become the coworking capital of the world. Office layouts will be more structured for liquid, easy work. 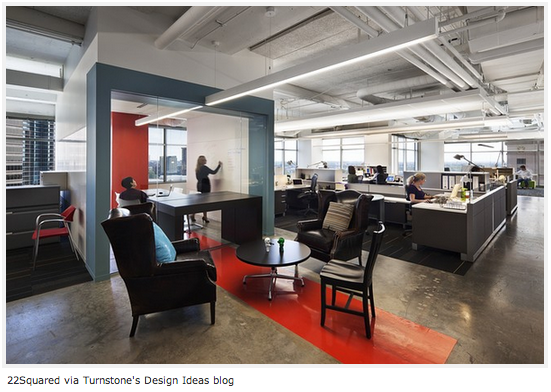 Office design innovation leaders like Turnstone make coworking furniture lighter and more comfortable. The architectural silos that separate departments will erode. You will know more about what’s happening in other areas of your organization. Open plans will create cafe-like atmospheres and promote creativity and transparency. New workplace tools like Flockd will help people across departments start conversations while increasing productivity. You’ll interact with coworkers in a more friendly, approachable and transparent way. Resources like kitchens, coffee, bathrooms, conference rooms and office supplies will be shared more often. Take a deep breath and get ready to share that pen in your hand, and maybe your monitor too! Juicy Questions? We have them too. We’re gathering March 5th and 6th for panels on, “Corporations and Coworking,” “Alternative Funding,” “Can Coworking Have a Deeper Impact on Society?” among others. See the full list of events here. The hybrid conference-unconference mixes professional speaking with collaborative DIY sessions. Led most recently by dynamo Liz Elam, founder of Link Coworking and president of LEXC, GCUC is largely a grassroots effort with support from a wide range of volunteers and sponsors. In a former life, Liz was a top sales executive at Dell; you can see where this trend started. It takes a tireless, inspired team to drive any behavior-change effort. Read more about them here. Keynote speakers include coworking space owners, property managers, investors, academics, and serial entrepreneurs. It’s a diverse crowd of professionals, all connected to the coworking movement in different ways. The official Twitter speak is @AustinGCUC, #GCUC and #unGCUC. People are traveling from every continent to join the dialog that will define the future of how we work, so buckle up! Financial crises, climate crises, and the growing iniquity of our market-dominated society have prompted a range of startups to ask what a New Economy might look like — and to start building it today. James Slezak (Purpose Partner and New Economy Practice Founder) joins Aparna Mukherjee (Social Media Editor for a major consulting firm, formerly of The New York Times, Bloomberg), Marissa Feinberg (Green Spaces NYC Co-Founder) and Erica Berger (Storyful, formerly of The Economist) for a panel discussion and debate on what trends and movements are best poised to disrupt unsustainable and unjust economic models. How can online strategies accelerate the movement towards sharing, co-production, renewable energy, and greater democratic influence on the economy? What’s working and what’s not? What role can big established organizations play, and where are the spaces for new social enterprises? Engage with our panel of experts on these questions and many more. Social media, collaborative consumption, and the sharing economy. 21 February 2013, Bloomberg Tower. With the emergence of 'collaborative consumption' startups such as Zipcar and AirBnB, many are pointing to the rise of a 'sharing economy' geared towards access to services rather than ownership of goods. What are the characteristics of this new economy, and how should we shape it? At the very least, given the sharing economy's reliance on human-to-human connection, one can be certain that social media will be a key utility. How does one define the sharing economy? For those hearing 'circle of value' or 'circular economy' the first time, this video, presented as part of the 2013 World Economic Forum in Davos, Switzerland, serves as a concise overview. Online and offline collaboration go hand-in-hand. Everyone is a social media entrepreneur, not that one actually needs a Twitter handle to be one (Remember, social media is human-to-human connection, not merely tools for online engagement.). To enable people to connect with each other as easily offline as they do online, Marissa founded Flockd so that individuals at a co-working space can quickly signal to each other whether and how they wish to connect in-person. Why not give credit to those who try? Mass appeal is not necessary to succeed -- niche appeal works just as well (or even better). Scepticism about Flockd from the audience. Apt example of marketing by social media entrepreneurs -- get a Flockd device by tweeting @we_flockd with #SMW. How can a diverse set of stakeholders (or rather, brandholders), collaborate to shape the sharing economy? Keep in mind that co-creation, or bringing all stakeholders/brandholders into your value chain, is the future of business. For the full story, visit http://storify.com/yangbodu/purpose-driving-the-new-economy-smwneweconomy. Thank you to Yangbo Du for posting this great timeline and commentary on our talk! To scale community, Marissa, a co-founder of Green Spaces in NYC and her friend Janice launched Flockd, an analog product for connectivity and productivity, inspired by the coworking movement and social concerns. It’s Marissa’s dream to create a new way for people to connect offline. It is Janice’s dream for everyone to live ‘on purpose’ which requires, among other things (such as knowing your purpose) a combination of creating genuine relationships and productivity. Flockd is a new low-tech product for your tabletop powering connectivity and productivity for a better world. You can use Flockd for connecting and collaborating, creating open-conversation zones, building an in-person following, being productive & staying in flow, sharing knowledge & ideas, signaling needs, resources & topics, branding & promotion. Thank you for this story, Erica Berger! Erica is Curator of 2462miles, Director of Partnerships for Storyful, and Contributor to The Economist and VentureBeat. It can sometimes feel like work takes over your life, especially when you are faced with daunting deadlines and projects that need constant attention. The little free time that you have can easily get spent on taking care of the daily tasks that were swallowed up by the work week. Coworking spaces are acutely aware of the fact that work can be overwhelming, which is why many offer services that make the daily routine more pleasurable and productive. Need a balance between social and quiet time? Flockd, a “real-world app” that launched last year during Global Entrepreneurship Week, is a tool that enhances connectivity and productivity. In partnership with several coworking spaces, including Green Spaces and New Work City, Flockd is made for open workspaces. The product was inspired by the relationships, innovation and ideas, which typically come to life in coworking spaces. People can use it as an invitation to build relationships, collaborate, form an in-person following, be productive, create open-conversation zones, and signal needs for new resources. Marissa of Green Spaces described the product as a pyramid shaped tool that users "can place on a table, writing their name, organization and topics on its dry-erase sides. The effect aims to be real-world Facebook, live tweet or spontaneous meet up. When people are busy, they turn Flockd on its side to set clear, healthy boundaries”. Tony of New Work City said that "Flockd will make it far easier for my members to feel comfortable being social while also being able to stay focused and be more productive. As workspaces continue to evolve away from cubicles and toward open environments, the need for something like Flockd is only going to grow.” Flockd is made of dry-erase, recyclable and customizable plastic. In essence, it helps create the perfect balance between being social and being productive, which is essential in the ever-changing workspace. The price of the product starts at 5 USD. Click here for the full story. Thank you so much for this great article, Deskmag! For a generation of workers who grew up connecting online, striking up a casual workplace conversation is harder than it seems. Enter Flockd, a startup that provides 3.8-inch-high, dry-erase pyramids that sit on a desk to indicate when a person is available for a chat. The pyramids serve the same function as Gmail colors that indicate when someone is "free" or "busy." Flockd, which has landed deals to sell its $5 pyramids to companies including a subsidiary of office furniture giant Steelcase, is one of a handful of new firm finding business models in the movement to help plugged-in people unplug. "While technology is doing amazing things for us in so many ways, we're still human beings, and the real world still exists in analog," said Tony Bacigalupo, co-founder and mayor of five-year-old New Work City, a co-working space that uses Flockd pyramids. "The more we get wrapped up in our online world, the more desire grows for better, healthier, authentic offline real-life interaction." Josh Auerbach, CFO of betaworks, a Manhattan firm that invests in and helps grow high-tech startups, points to the dozens of e-commerce brands that set up temporary brick-and-mortar "pop-up" shops in Manhattan for the holidays as another example of the trend. Familiar online names including eBay, Etsy and Web-based clothier Everlane have increasingly been doing some of their work offline. Other companies are organizing intimate gatherings where customers mingle with advertisers. Intended to provide face time for online-only brands, the events also help to bring in more ad revenue. "Companies are looking to get noticed, stand out—basically shout over the noise—and right now in-person events and physical spaces are a pretty good way to do that," said Mr. Auerbach. Digital media firm PureWow, a 23-employee Manhattan company whose lifestyle newsletter, website and social-media outlets attract about 1.5 million 30- to 54-year-old females across the country, has found that events are important to building a sense of community among its members. The company, which is profitable, recently invited more than 200 Dallas-area bloggers and readers to a launch party that was sponsored by liqueur brand Baileys. The party, which generated a pile of content for the company's site, led to a second Baileys-backed event, this time held in Manhattan with a mix of local entrepreneurs and PureWow readers. "For us, it's brand awareness," said PureWow CEO Ryan Harwood, who said his company's revenue is in the mid-seven figures. "We're showing our audience that we're real—where they can see our editors and where we see our readers and we can build a bigger sense of community." Membership for 2012 is up four times over last year. A strategy that combines online and offline might be the most powerful, according to new research from Active Network, a San Diego firm whose Web-based software helps clients such as Bike New York and the New York Stock Exchange organize events. According to a November report, 99% of the 500 consumers surveyed took action offline—such as attending a charity or social event or participating in a sport—as a result of interacting with a Facebook or Twitter connection online. "The common irony is that people are more active on social networks than in their personal lives," said Kristin Carroll, vice president of corporate and consumer marketing at Active Network. "Within social networks, there is opportunity to motivate people to do things they otherwise wouldn't." To that end, Flockd's co-founders are debating whether to create a smartphone app that somehow ties in with their pyramids and their Facebook and Twitter feeds. In the meantime, the company is hiring salespeople and hoping to expand into more shared workspaces, high-tech firms and, eventually, public spaces such as coffee shops, universities, hotels and airports. "The co-working movement is doubling each year," said co-founder Marissa Feinberg, who is also a founder of Green Spaces, an eco-minded co-working space in Manhattan with revenue of under $1 million. Mr. Bacigalupo says conversation has spiked in his office since the introduction of the pyramids. "What Flockd does is give people a way to sort of easily bump into each other in ways that they might not have otherwise," he said. "It lowers the barrier for people to meet each other." Correction: PureWow is a digital media firm. The company description was misstated in the summary for an earlier version of this article, published Dec. 19, 2012. NEW YORK, Nov. 15 - FLOCKD, a new real-world app, powering connectivity and productivity for a better future, launches its pilot product this week during Global Entrepreneurship Week. In partnership with New Work City, Purpose, La Colombe and Green Spaces, among others, the pyramid-like tool hopes to catalyze open-source connections in physical spaces everywhere. Users put Flockd upright on a table, writing their name, organization and topics on its dry-erase sides. The effect aims to be real-world Facebook, live tweet or spontaneous Meetup. When people are busy, they turn Flockd on its side to set clear, healthy boundaries. La Colombe Torrefaction will supply courtesy coffee, often the lifeblood of entrepreneurs also powering productivity, to pilot participants. The timing of the pilot coincides with Global Entrepreneurship Week. To celebrate, Flockd will release the first 2,000 Flockd pyramids gratis to people who sign the Flockd Manifesto, inviting all to join this movement. Additional partners include Purpose, New Work City and Green Spaces, and iSTARTUP Community Centers. Flockd will offer a pop-up at Green Spaces, 394 Broadway, 5th floor (directions), where the media is invited to join and flock. To nominate a space or make yours "Flockd enabled", visit flockd.com. Flockd is a NEW real-world app, powering connectivity & productivity for a better future. We live in networks: Facebook, Twitter, LinkedIn, Foursquare, and many more. People can easily connect online. What about offline? People can use flockd as an invitation for building relationships, collaborating, building an in-person following, being productive, creating open-conversation zones, and signaling Needs, resources & topics. Flockd invites people to sign its manifesto, and invite connections, connect dots, and take action for a better, more connected and productive world. Experience Serendipity. Listen and Hear. Be Mindful. Help Yourself, or Someone Else. Be Open. Share Your Story. Appreciate Diversity. Further a Global Understanding. Know We Are All Connected. Acknowledge Surroundings. Be Yourself. Collaborate and Take Action. Meet Someone New. Bring a New Idea to Life. Create a Community. Organize Chaos. Drive a Purpose. Public Speak, in Conversation. Keep Values in Mind. Respect All People. Share. Evolve. Manifest. Flock. New Work City is the result of the collective effort of a community of people who share a common set of values and needs. We are proudly built and based in New York City, the greatest city in the world. To learn more about the amazing people who make New Work City possible, visit ourabout and thanks pages. We are a part of the global coworking movement, and if anyone says it's spelled co-working, send them here to correct them! As an inherent connector, Marissa enjoys sharing stories and championing people and ideas that make us think, laugh, do good, and take action to pursue our dreams. And since it’s the work of changemakers that have the most touching stories and make the greatest difference, Marissa co-founded Green Spaces New York, the go-to coworking space for social entrepreneurs to work, innovate, and host meaningful events that drive dialog and action. To follow her love of connection culture, Marissa is launching Flockd, a real-world app for connectivity and productivity, inspired by coworking spaces and social movements with the dream to create a more open society. In addition, Marissa serves on the boards of Green Map, NYU Stern’s Annual Conference of Social Entrepreneurs, and the Zoological Lighting Institute. Marissa also speaks about PR for Early Stage Startups for Investor’s Circle Conference, NYC’s and Kaufman’s FastTrac program, and for Parsons The NEW School for Design. Prior, she worked in CSR for the General Electric Foundation and social design for Felissimo Universal Corporation of America.